A cyclist struggles through the snow covered streets. Anshan is hot in summer and bitterly cold in winter. In the background, the Vanke office building towers over the Anshan Communist Party Headquarters which overlook Shungli Square. Ānshān (鞍山) is the third largest prefecture level city in Liáoníng province of China. Situated in the central area of the province, it is about 92km south of Shěnyáng, the province's capital. Anshan is on the boundary between the Mountains of eastern Liaoning and the plains of the west. The area contains the famous Qiānshān National Park. The city's name is derived form the shape of a nearby mountain (in Chinese shān 山) that resembles the shape of a horse's saddle (Ān 鞍). Anshan is home to the Āngāng Iron and Steel company, one of the largest steel producers in China. The area of Anshan has been inhabited since prehistoric times. The area remained of little significance, overshadowed by neighboring Liaoyang city, until the late 20th Century. Japan had gained influence in Liaoning and was industrialising the region. A joint Sino-Japanese venture, Anshan Zhenzing Iron Ore Company Unlimited was started in Anshan in 1918. After the Japanese occupied the northeast of China in 1931, the company was turned into a Japanese owned monopoly. Anshan was occupied by the Japanese and was part of the Japanese puppet state of Manchuco. The Japanese founded a steel mill along side the existing iron works in Anshan. The city grew in size around this new industrial site. The defeat of the Japanese in 1945 saw Anshan returned to China. However, peace had not yet arrived. Civil war continued between the Chinese Nationalist Government and the Communist People's Liberation Army. The city of Anshan was the scene of one of the battles of this war. A monument in Lishishan park commemorates the battle. On the 19th of February 1948, Anshan was liberated by the PLA. The north east of china was marked out to become a major industrial center for the new People's Republic of China. Anshan was set to become a key part of this industrial development. The steel mills had been damaged during the wars. In December 1948, the Anshan Iron and Steel Company - also known as Angang - was founded. Production in the newly repaired steel plant resumed on July 9th 1949. The plant was expanded to become, at one time, the largest steel producer in China. Other industries setup along side the steel plant including mining for coal, iron and other minerals. This industrial wealth had a environmental cost. The open-hearth furnaces of the steel mill created large amounts of dust and other pollution. Along with its growing reputation as a major steel producer, Anshan was also gaining a reputation as a dirty, smelly town. Renmin Park may be small, but it is popular. Large crowds of people gather there every evening for meet and take part in activities such as Taichi, Ballroom and Line Dancing, Exercising, playing music, flying kites and more. The woman is leading this group of men and woman in a line dance. Situated in the North East of China, what the Chinese now call Dongbie (East-north), and known to history as Manchuria, it is not surprising that Anshan prefecture is home to many people form the Manchu ethnic group. What may surprise is how small this population now is. Of the 3,584,000 people living in Anshan prefecture, only 519,400 are Man nationals. They are mainly in or around the Xiuyan Man regional national autonomy area which is within Anshan's borders. During the last years of the Qin dynasty, large numbers of Han people migrated to the north east in search of work. This pattern continued into the 20th century. The development of Anshan as a large industrial center during and after world war II caused the cities population to increase rapidly. The new arrivals significantly out numbering the local Man people. As of the last census data, Anshan was home to 48 Chinese ethnic groups. The Han people make up the lions share at 3,020,500 people. Next, after the Han and Man people, come the Hui nationality and the Chaoxian with 23,400 and 10,000 people respectively. The Hue population is widely dispersed but the Chaoxian population is mostly concentrated in Teixi (West district) and Qianshan district. The Buddhist temples in Qianshan mountain are decorated in traditional Chinese style with ornate animals on the roof tiles and colorful lacquer paintings. Foremost among the attractions in Anshan is Qianshan National Park (千山) which is about 18km by road, to the south east of the city. Qianshan literally means, 'Thousand Mountains'. The name is actually and abbreviation of 'Thousand lotus flower mountains'. The peaks were said to resemble the petals of the lotus flower which had been dropped to earth by a goddess. The park area of 44 square kilometers, is filled with both Buddhist and Taoist temples, monasteries and nunneries. It is one of few locations where both religions are found sharing the same site. Motor cars are not allowed within the park. Tourists must either walk or hire one of the electric taxi's. Many foot paths climb steeply up the hillsides through thick forest. These foot paths lead past, Steele, honoring the dead, small shrines, pagodas and temples. For those who are less fit, three cable car routes can convey you up the hill sides. However, none of the cable cars will take you the whole way, leaving you some climbing to do by yourself. One mountain in the park is shaped in such a way that it resembles a Matria Buddha. It is claimed to be the largest naturally occurring image of Matria Buddha in the world. Several temples have been built on the peaks of the overlooking hills. Near the Matria Buddha is a large net enclosed area which contains an bird park. 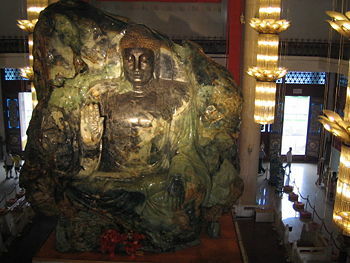 The worlds largest Jade stone carved with the image of Buddha is a major tourist attraction in Anshan. Anshan contains naturally hot spring water spas. There are four spas/hotels in Anshan. Visitors may shower and bathe in the spring water. At Tanganxi Spa, once frequented by the Qin Emperors of China, visitors may have mud treatment where they are buried in hot volcanic sand, which has been infused with the spring water. The geothermal energy is also used to provide hot steam and water for winter heating throughout the area. The north east of China is a major industrial zone and Anshan is one of the key sites of the north east. The city is renowned as "China's capital of iron and steel." The Anshan Iron and Steel Company (Angang) was founded in 1948. Form then to 2001, the company produced 290 million tons of steel, 284 million tons of pig iron and 192 million tons of rolled steel. Until relatively recently, when a new steel plant opened in Shanghai, Angang was the largest steel producer in China. Today, Angang consists of three steelworks with 13 rolling mills plus supporting plants which produce coke, refractory materials and machinery for the steel plants. The company has an annual production capacity of 10 million tons of pig iron, 10 million tons of steel and 9.5 million tons of rolled steel. A quarter of China's total iron ore reserves, about 10 billion tons, are located in Anshan ensuring that the city will remain an important steel producer well into the future. Sited on the edge of the Liao River plains, Anshan has wide flat lands in the west and central regions that develop into hilly and the mountainous terain on the eastern fringes. The area is rich in minneral wealth including iron ore, coal, magnasite, talcum and jade. The plains of western anshan are good for agriculture. The large flat fields make it idea for modern agricultural methods. In total, anshan containt 24480 hectares of arable land accounting for 26.4% of the total land area. One agricultural product that Anshan has become well know for is the production of Nangua Pears. Anshan has no public airport and no river or sea port so the only routes in or out are by land. The nearest airport is Shenyang Taoxian International Airport (SHE), about 90km to the north. The city is beside the Shanda highway (沈大高速公路) which runs between Shenyang and Dalian (the two larger cities of Liaoning province). This is a privately funded eight-lane tolled highway and was the first road of its kind in China. Anshan is also connected to the Chinese rail network with rail routes to Beijing, Dalian, and to the north-eastern provinces of Jilin and Hēilóngjiāng as well as to eastern Inner Mongolia and Russia. Long-distance coaches run to all the main cities of the province as well as to Beijing. ↑ Population and Nationality (HTML). Anshan Municipal Government. Retrieved on 05-12-2007. ↑ Huang, Youyi; Xiao Siaoming, Li Zhenguo, Zhang Zouku (2006). Liaoning, Home of the Manchus & Cradle of Qing Empire. Foreign Languages Press, Beijing, China, 227. ISBN ISBN 7-119-04517-2. This page was last modified 00:58, 8 February 2010.